Home Do we need book fairs? Do we need book fairs? Once again we are having an "International Book Fair" in Colombo. It is the talk of the town this month. The organizers will count the footfalls and be proud about the achievement. For nine days there will be a huge traffic congestion around the BMICH. The book fair is the largest annual crowd puller in the country. Do we really need book fairs today is the question that comes to mind, every year. In the same way that the Neanderthals disappeared from the face of the earth with the invasion by the 'early modern humans' the printed book is also threatened by the e-book and the audio book. However the printed book will never become extinct, it will remain with us for a long time to come, while the book fairs as we know them today will become extinct in the near future. Book Carnivals for 'entertainment', and for the organizers to make profits, will continue, like the mockeries of festivals held in the name of literature, in Jaipur or Galle. Yet for anyone who wants to buy a book, there are book fairs which are open anytime. You can visit these book fairs at your convenience, browse through the books, even read a few pages, check the price of the book at other vendors, order the book, sit back and relax till the book is delivered to your doorstep, or to your computer. Even before the digital books take over the market from printed books, digital technology has already taken over the marketing of printed books. Today almost everything a man needs could be searched for, located, and purchased in cyberspace. All this started twenty years ago, with the launch of Amazon for online sale of books and eBay for online auctions. Amazon 2014 sales figure was $ 90 billion worldwide. The best place to search for a book today is the internet, whether it is for a new print, a used book, a first edition, or as a soft copy. Many book publishers and sellers too are now competing with Amazon, selling their books online directly to customers. 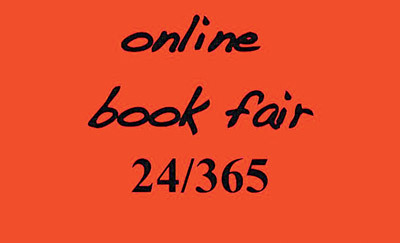 These book sellers have their own permanent 24/7 book fairs in cyberspace, while Amazon is the largest International Book Fair in cyberspace which never closes its doors. There are also sites like bookfaironline.net, who claim, "It encourages dialogue and mutual cultural understanding by providing a neutral platform to all publishers and writers around the world. It's available online 365 days a year, there is no need to travel across the hemisphere, no need to pollute the planet by flying and shipping books to the four corners of the earth. Bookfaironline.net is committed to reduce the carbon footprint within the publishing industry." The cultural festivals like the Kolkata Boi Mela is fading away. But people still fly from all over the world, leaving a huge Carbon foot print, just to attend the book fairs in Frankfort, London, Delhi and all other cities, when they can find in cyberspace all the books displayed. Book sellers also invest millions to showcase their books here. Some of our booksellers too participate and display their books, when they could display all their books online to all the readers around the world, at a much lower cost. When we can visit such book fairs in the comfort of our home or office, or from anywhere on earth as long as we have an android phone and a connection, there is really no necessity to visit a congested venue to attend a book fair. Driving is a nightmare and finding a parking space is far worse, unless we are lucky to share a ride with another person. Public transport is still worse, even though the organizers arrange a shuttle bus service to a few locations in the city. Some of the book stalls are so crowded, that one could only crawl between book shelves, pick a book at random and wait for ages at the sales counters. A book lover now living in Toronto lamented that she will be missing the book fair this year and wrote on Facebook, "The smell, the sight of books, touching them, holding them and reading bits, the conversations with like minded people..." But this is just wishful thinking, all one could smell is the food and the sweat, and conversations about parking problems, the crowds and what is to eat, and where. The traditional book fairs are for the benefit of the publishers and sellers. They make us buy what they want to sell, or to get rid of, from their non-moving stocks. We do not have the opportunity to check out the books, have a choice of what we want to buy. The sellers abuse the human instinct for impulse buying. They keep the books they want to sell, at our eye level, within easy reach. We end up buying them, because they do not display the books we really want to buy, or they keep them out of our reach. We believe we get bargains, when they offer special discounts. But we are only deceiving ourselves. Most publishers offer the same discounts at their own bookshops, throughout the year. If the postal services offer a reasonable rate for book posts, then it would benefit both the publisher and the reader, as it would save both time and money, to order a book by post, than to visit a book shop. Or a local courier service should make an attractive offer for home delivery of books. The time has arrived for the Book Publishers Association to have a permanent book fair in cyberspace from 2016, to offer a real service to the readers at less cost and effort. Save time. Avoid the hassle. Visit all the book fairs in cyber space.